There are no drivers on internet. 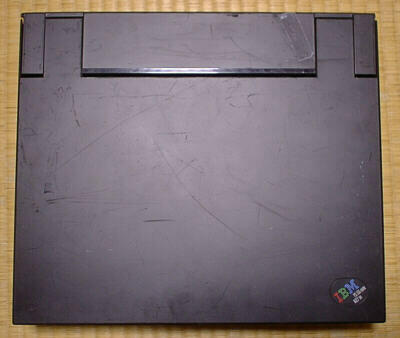 As I wrote in "Junk Junky", I think it's the biggest IBM notebookPC in the world. 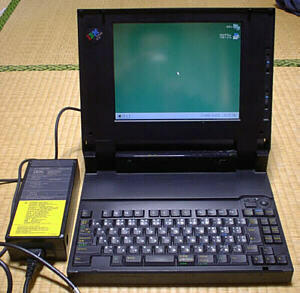 It is also the 1st notebookPC with TFT LCD display, and I heard the beautiful display surprised the people on that day. As you look, the AC adaptor is also as big as a brick. The emblem is also big(....?). The charactors are in 3rows. 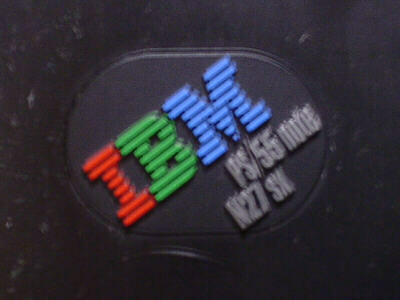 It looks proud because IBM is in R/G/B tricolor(that tells this PC has a color display). 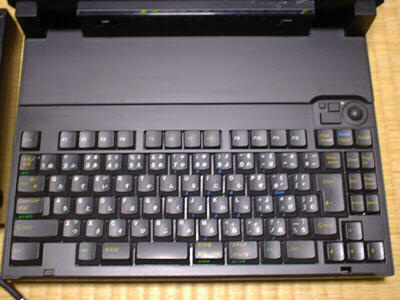 The keyboard is delicately different from 106/OADG JIS keyboard. Although the pitch of each key is sufficient, those touch is not so good. And more, because there are some keys on right side of "Enter" key, I often miss the type. On those days when N27sx was developed, TrackPoint has not been developed yet. 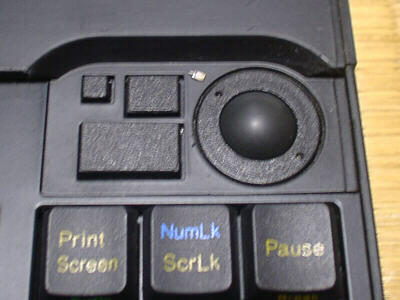 So this huge notebook has trackball pointer with 3 bottons. Someone says "It's difficult to operate", but I don't think so. Of corse, The usability is not compared with TrackPoint that I love. On those days, It was so difficult to make thin fluorescent tube for LCD panel. So the thickness of N27sx's panel is incredible on today's standard. (it is more than 1.2inches). 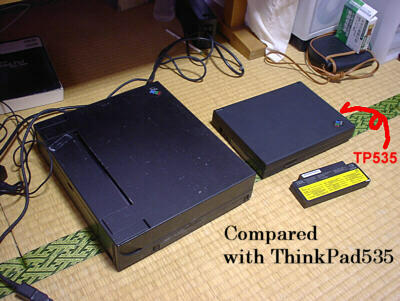 You can imagine how it is thick, in comparison with ThinkPad535. it is so thick that the brightness/contrast volume is dial-shaped. 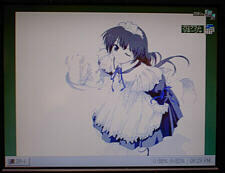 Although it displays so beautiful(above pictures are relatively dark as it looks truely), It displays only 16colors because it has only 384Kbytes of VRAM. 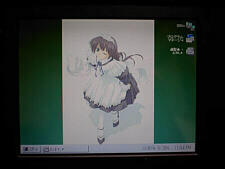 So the wallpapers should be decreased for 8 colors or 16colors on system palet. I think this PC may be a experimental machine. This 2 batteries explain this. I heard it doesn't run not more than 1hour with these packs. 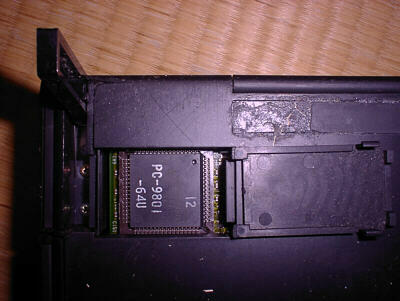 The optional memory is installed on DRAM card(with parity) slot under MODEM slot. Maximal memory is 16MB because of Maximal CPU adrressing is 16MB. This machine is installed 2 8MB of DRAM cards, but there are 2MB of internal memory. So about 4MB on DRAM card is useless. The slide switch? (where red arrow points) is the system power lock. If you forget to turn on this, the system never boot up. 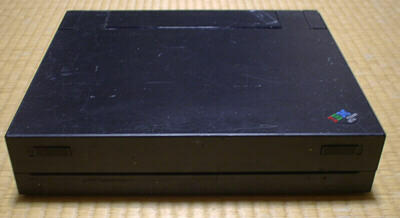 The largest connector is "Micro Channel Architecture" external BUS. 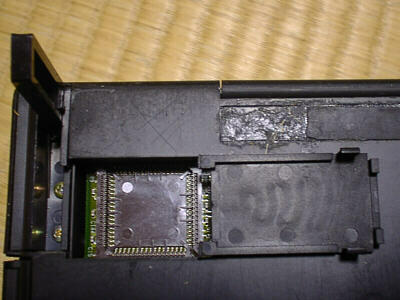 N27sx has no other common I/Fs but serial/pararell port that is used for the Local Area Network I/F. So I think LAN I/F may be connected to this I/F. 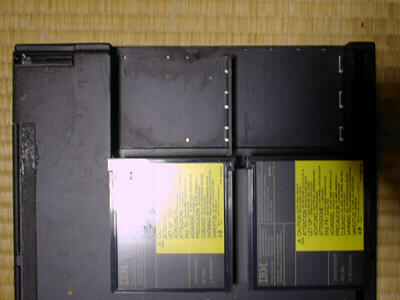 But now, MCA devices have never been seen, even if you look for it in "Akihabara Junk shops". 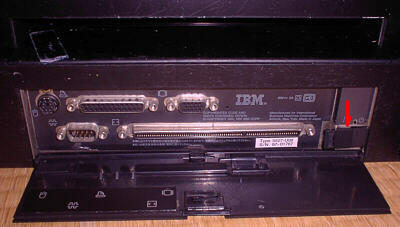 The CPU of N27sx is i80386sx-20MHz. 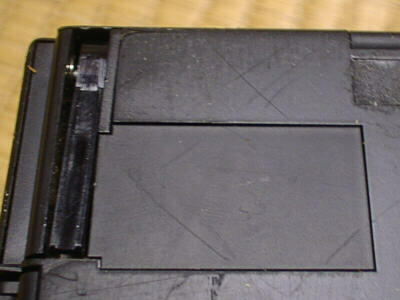 It's as poor as "Olivetti Quaderno", but N27sx can be installed i387SL FPU. The Coprocessor socket is near the right side slant pillar. 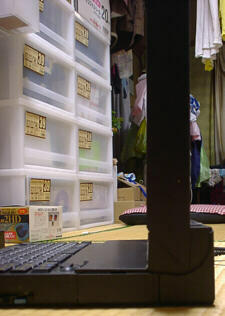 Standing the pillar and opening the cover, the socket can be seen. 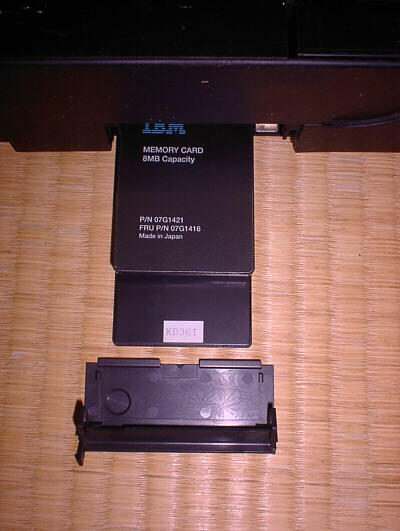 When you boot up the system after installing Coprocessor, the error code "174" must be appeared and "IBM system reference diskette program" boots up. This is the error that "there are new devices that have not been configured to the BIOS yet". 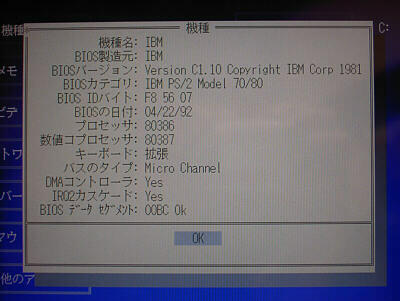 So you have to configure the new device to BIOS with "IBM system reference diskette program"(this program boot up automatically from invisible area in HDD). 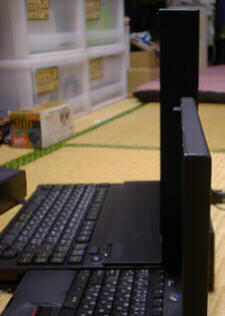 After configuring it, the system and OS recognize FPU normally.